Concert for Diana was a benefit concert held at the newly built Wembley Stadium in London, United Kingdom in honour of Diana, Princess of Wales, on 1 July 2007, which would have been her 46th birthday. 31 August that year brought the 10th anniversary of her death. The concert was hosted by Diana's sons, Prince William and Prince Harry, who helped to organise many of the world's most famous entertainers and singers to perform. Proceeds from the concert went to Diana's charities, as well as to charities of which William and Harry are patrons. The concert was broadcast in 140 different countries across the world with an estimated potential audience of 500 million. In December 2006, 22,500 tickets were made available for purchase for the concert, selling out in just 17 minutes, while 63,000 people turned out to Wembley Stadium to watch the performances to commemorate Diana. At the end of the performances, a video montage of Diana as a child was presented, accompanied by the Queen song "These Are the Days of Our Lives". The concert started at 16:00 BST and finished at approximately 22:15 BST – there were two short intermissions during the concert. A 2-Disc DVD set of the full concert was released on 5 November 2007. A Blu-ray high definition release of the full concert and documentary was released in November 2008. Elton John – "Your Song"
Duran Duran – "(Reach Up for the) Sunrise", "Wild Boys" and "Rio"
James Morrison – "You Give Me Something" and "Wonderful World"
Lily Allen – "LDN" and "Smile"
Fergie – "Glamorous" and "Big Girls Don't Cry"
The Feeling – "Fill My Little World" and "Love It When You Call"
Pharrell – "Drop It Like It's Hot" and "She Wants To Move (Remix)"
Nelly Furtado – "Say It Right", "I'm Like a Bird" and "Maneater"
Status Quo – "Rockin' All Over the World"
Joss Stone – "You Had Me" and "Under Pressure"
Roger Hodgson – Supertramp Medley ("Dreamer", "The Logical Song" and "Breakfast in America") and "Give a Little Bit"
Orson – "Happiness" and "No Tomorrow"
Will Young – "Switch It On"
Bryan Ferry – "Slave to Love", "Make You Feel My Love" and "Let's Stick Together"
Connie Fisher and Andrea Ross – "Memory"
Andrea Bocelli – "The Music of the Night"
Josh Groban and Sarah Brightman – "All I Ask of You"
Donny Osmond, Jason Donovan, Lee Mead and Chickenshed – "Any Dream Will Do"
Rod Stewart – "Maggie May", "Baby Jane" and "Sailing"
Kanye West – "Gold Digger", " Touch the Sky", "Stronger", "Diamonds from Sierra Leone" and "Jesus Walks"
P. Diddy – "I'll Be Missing You"
Take That – "Shine", "Patience" and "Back for Good"
Ricky Gervais – "Freelove Freeway" (with Mackenzie Crook), "Chubby Little Loser"
Elton John – "Saturday Night's Alright For Fighting" "Tiny Dancer" "Are You Ready For Love"
The Prince of Wales was not among the spectators. Together with the Queen, then Prime Minister Gordon Brown and his predecessor Tony Blair, he was among the guests at the Diana, Princess of Wales memorial service on 31 August 2007 in the Guards Chapel. In pre-concert interview, Prince William listed Michael Jackson as one of Diana's most favourite music acts, but Jackson did not appear on the show. In one of the many tabloid stories that surfaced relating to the concert and the following week's Live Earth event, it was alleged that Madonna, the Red Hot Chili Peppers, Keane, and other acts were set to play at the concert but were lost to Live Earth. The concert organisers were apparently trying to secure their top acts, and are also being pressured into rethinking their lineup to appeal to younger people, and compare to Live Earth. Kate Middleton, now Prince William's wife, and Chelsy Davy, the now ex-girlfriend of Prince Harry, attended the concert. It has been rumoured that they were involved in helping to plan the event. Queen guitarist Brian May was expected to perform alongside Joss Stone in her version of "Under Pressure", but pulled out of accompanying after finding the new arrangement of his band's song "different... from the original". The concert was broadcast in 140 countries. Jamie Theakston, Fearne Cotton and Claudia Winkleman presented for the BBC and many other television channels across the world. In the United States, VH1's coverage was presented by Aamer Haleem, Kate Thornton and Dave Berry. In the United Kingdom the concert was broadcast on BBC One, BBC HD and BBC Radio 2. The concert was watched by an average of 8.9 million viewers, and peaked with 14.8 million. Over the 8-hour period it had a 44% viewing share. It received considerably more viewers than the Live Earth concert which was broadcast a week later. Unlike other international events, the Concert for Diana wasn't broadcast by RAI. The live feed was aired by satellite broadcaster Sky Italia on its Sky Vivo channel from 17:00 to 23:00. The concert was also broadcast on commercial radio by RTL 102.5. In the US, MTV Live and VH1 broadcast the concert live from 11 am (EDT) The concert drew near double the viewing figures for the 2005 Live 8 concert with 1.4 million average over the 8 hours. NBC broadcast a highlights show between 8 pm-11 pm EDT. The NBC showing was the US most watched programme, averaging 8.7 million viewers. In Canada, the concert was broadcast live on CTV with a two-hour primetime special highlighting the best performances. The concert reached 2.8 million viewers and the primetime recap peaked at nearly 1 million viewers. VH1 Latin America broadcast the concert in Latin America, the Caribbean and Central America. DStv carried it in Africa by showing it on a dedicated channel for the event. Prior to the concert there were television specials on the channel. Star TV throughout Asia, except Japan where it was shown by WOWOW. As with many live televised events, the Concert for Diana had a few technical problems, the most obvious of which occurred during comedian Ricky Gervais's stand up routine, before Elton John's musical finale. As a planned seven-minute routine became twelve minutes, viewers saw Gervais play to the sympathies of the crowd as a stagehand held up signs saying 'two minutes', then 'one minute'. The stand-up comic delivered a rendition of a song that David Bowie performed on his show Extras before finally being told to 'throw to the BBC' and presenters Claudia Winkleman and Jamie Theakston. During the extended piece, he performed his famous "dance" from The Office. All net proceeds from the Concert went to the charities chosen by Princes William and Harry. These charities include Diana, Princess of Wales Memorial Fund, Centrepoint and Sentebale, a charity founded in April 2006, by Prince Harry and Lesotho's Prince Seeiso. It helps vulnerable children and young people in Lesotho – particularly those orphaned as a result of AIDS. During the airing of the concert, Diana, was hailed for her generous charity work with the Chain of Hope, Luton Indoor Bowling Club, and British Deaf Association charities. She was also celebrated for her work with the British Red Cross in helping get the word out on land mines in Angola. ^ a b c "Kanye West, Rod Stewart to perform at Diana concert". ABC News. Retrieved 1 July 2007. ^ "Pop stars pay tribute to Princess Diana". Yahoo News. Retrieved 1 July 2007. ^ "Chelsy and Harry get close at the Diana concert ... but Kate and William keep their distance". Daily Mail. Retrieved 1 July 2007. ^ "Sir Elton launches Diana concert". BBC News. Retrieved 1 July 2007. ^ "The sons & the stars". The Telegraph. Retrieved 1 July 2007. ^ a b c "Concert for Diana - What happened minute by minute". BBC News. Retrieved 4 July 2013. ^ a b c d e f g h i "Princes open Wembley Diana concert with joke". The Telegraph. Retrieved 18 May 2015. ^ "Princes lead Diana memorial service tributes". The Telegraph. Retrieved 18 May 2015. ^ "William Invites Kate To The Concert For Diana Archived 26 September 2007 at the Wayback Machine". The Royal List. ^ "Brian May turns down Concert for Diana". brianmay.com. 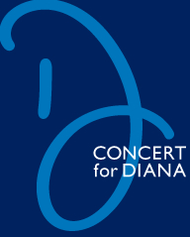 ^ "Concert for Diana". BBC. Retrieved 18 May 2015. ^ "Live Earth no match for Diana or Venus". Digital Spy. Retrieved 10 July 2007. ^ "The Earth didn't move for BBC1". Broadcast Now. Retrieved 9 July 2007. ^ "Diana Boosts VH1 ratings". Yahoo!. Retrieved 10 July 2007. ^ "Diana Concert attracts most viewers". The Hollywood Reporter. Retrieved 10 July 2007. ^ "Concert for Diana reaches 3million Canadians". Channel Canada. Retrieved 10 July 2007. ^ "Charity Archived 17 July 2007 at the Wayback Machine". Charity.